On the 12th day of Christmas, my true love gave to me...the perfect combination of sweet and salty - Candied Bacon! If you haven't tried Candied Bacon, you are missing out! Our 30pc packs offer enough to share, but you won't want to!! 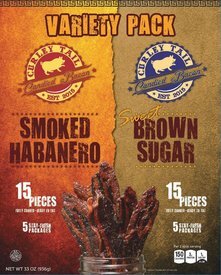 Three flavor options: Sweet Brown Sugar, Smoked Habanero or Variety Pack (15 pieces of each flavor). SPECIAL OFFER: 30pc Candied Bacon Packs now on sale...plus FREE Priority Shipping!! 12 DAYS OF CHRISTMAS! From Dec 1 - 12th, we will be sending out daily special offers on our most popular Bacon products! Special is valid for a limited time only, and only while supplies last!